It’s so time to get ready, like yesterday… they’re scouting and building nests already in most parts of the country. Yes, Bluebird season 2012 is here! 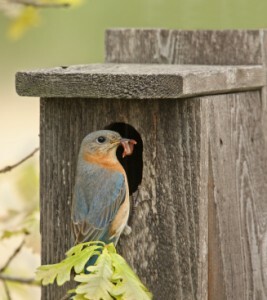 If you haven’t done so already, check for old nests in bluebird houses (and other nest boxes too). 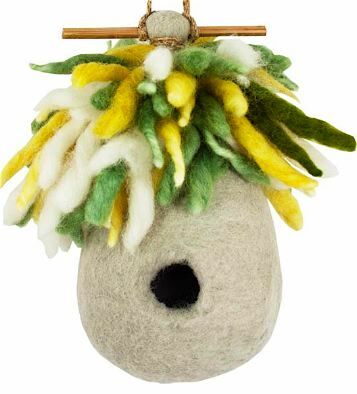 Best to wear gloves for this chore, and dispose of the nest away from the birdhouse as old nests will attract predators. 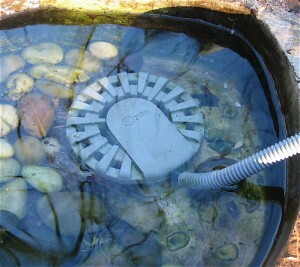 Clean the box with a mild bleach/water solution (1:10). Scrub, rinse well with water, and let dry in the sun. The NABS reference above? It stands for the North American Bluebird Society, who gives their approval on certain bluebird houses. 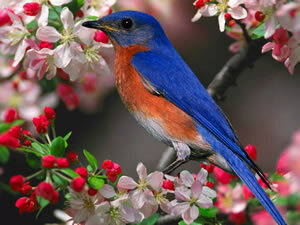 The houses must meet specific criteria that’s beneficial to hosting successful bluebird broods and fledges. This is elementary stuff for serious blue-birders, but so many of us are novices and we all have to start somewhere! If you’ve been unsuccessful in enticing bluebirds to your yard, there are lots of great suggestions, and some fantastic information at www.sialis.org. We would strongly recommend this well organized and informative site for anyone interested in hosting blu ebirds. Bluebird houses will differ for the Eastern and Mountain/Western Bluebird, although Eastern Bluebirds may use a Mountain Bluebird House. Eastern Blues require a 1-1/2 inch diameter hole, where as Mountain/Western Blues require a 1-9/16 inch entrance. This is where some of NABS Approval comes into play because an entrance that is 1-5/8 inch, will allow Starlings to enter the box, but Starlings can not enter through a 1-9/16 inch hole. Now who would know that? Floor size (4×4 for Eastern Blues, and 5×5 for Western/Mountain Blues) and ventilation are some other criteria for approval by NABS. A predator guard at the entrance of your bluebird house always helps to ensure successful fledges, as does a baffle if the house is pole or post-mounted. Water, food, and potential nesting spots are key to enticing these fantastic birds! Bluebirds prefer open area for their hunting style (swooping to catch insets), so if your yard is heavily wooded, chance are Bluebirds won’t find it suitable… but other birds will. Chickadees and Nuthatches are already scouting nest boxes and building nests too. We just tried put up one of those side-entry houses supposedly meant for Nuthatches… we’ll see how that goes soon enough. 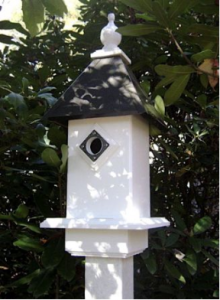 Spring has sprung early this year, so get in the yard and help local birds thrive! In anticipation of the great hummingbird migration, all the hummingbird feeders were pulled from storage last night. With the mild winter season we’ve had in the South, the little sprites may be returning earlier than usual this year. Such an endearing and favorite of all our migratory friends, we roll out the red carpet so to speak! 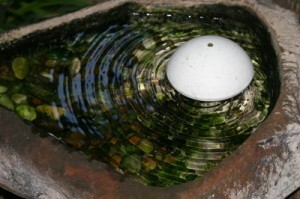 One of the plastic hummingbird feeders was looking a bit cloudy, although it was cleaned prior to storing last season. While making the first batch of nectar (so simple-recipe below) I had the brilliant idea to pour some of the boiling water in the feeder to “clear it up”. The feeder proceeded to melt in my hand… I couldn’t grasp what was happening at first, until I ended up with a Salvador Dali-looking hummingbird feeder! Really should have taken a picture, but was too disappointed in my better judgement. The feeder’s usable for now, but it sure does look funky. 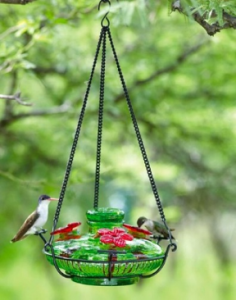 This is exactly why we prefer blown glass or ceramic hummingbird feeders over plastic ones. The quality just can’t be compared. 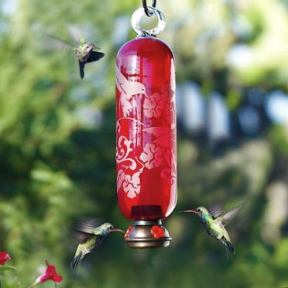 Instead of buying a new feeder every other season, handcrafted hummingbir d feeders from artists and companies like Parasol and even BirdBrain will last a lifetime. They can be run through the dishwasher for easy cleaning, and they’ll never turn cloudy or yellow over time. The Dali-looking feeder will now be replaced for the last time with this beauty. Mix 1 cup plain table sugar to 4 cups water. NOTHING ELSE, no substitutes as they may be harmful or even fatal to hummingbirds. Plain, Pure Cane Sugar is the only ingredient to use for nectar. No red dye either, it’s a big myth! There’s no need to boil the water, as any organisms spread are by the hummingbirds’ beaks. We do boil one cup of water, simply to dissolve the sugar more effectively. 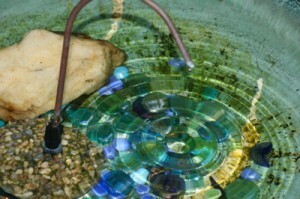 Let cool, fill feeders, and store unused nectar in the fridge for up to two weeks. That’s it! If you’ve never made your own nectar, we encourage you to try it this season, hummingbirds seem to prefer it, and it will be the least expensive bird food all year! The damage from the oil spill happened in the Gulf, and Congress should ensure that the oil spill fines go back to the Gulf. After months of work, fits and starts, and some late hours last night, Audubon has achieved two huge wins for birds and habitat. The Senate has voted to direct BP Clean Water Act penalty money towards Gulf restoration, and beefed up funding for the Land and Water Conservation Fund. The billions that will go to habitat and restoration will mean more birds and wildlife conservation. It’s been almost two years since the horrific BP blowout that dumped millions of gallons of oil into the Gulf of Mexico. Getting BP penalty money to the Gulf—where it is needed most—has been an obvious but difficult road. Without Congressional action, that penalty money goes to the U.S. Treasury. Today we have that action in the Senate. The second win means good things for the Land and Water Conservation Fund, newly reauthorized through 2022 and with a strong infusion of much-needed funding—$1.4 billion over two years—for this benchmark habitat conservation/acquisition program, also a long-standing priority for Audubon. And to pile on even more good news, a handful of bad amendments — including two that would have fast-tracked the Keystone tarsands pipeline — were defeated. Attacks on EPA and the Clean Air Act and an amendment to push more offshore drilling could not muster enough votes to win either. Audubon members and activists lit up the Senate switchboard with calls in support of the Gulf/LWCF amendment. The Transportation bill will go to a final vote soon. Look for a breaking alert early next week—our emails and calls can help win that critical vote. This is an incredibly exciting, pinnacle moment for Audubon and comes from the hard work by loads of people—our wonderful members, activists and chapters among them. Thanks for all you’ve done to get us here; next week we hope to take the next step to seal the deal for the Gulf and a lot of other critical habitat through passage of the Senate Transportation bill! Watching blue bird houses is starting early! I only know this because every day my roommate, Beth (The Birdhouse Chick) grabs her binoculars and looks with anticipation to the blue bird houses to check for signs of nesting. It’s a yearly ritual that she has fostered by maintaining blue bird houses and feeders, and providing live worms (yes, we have worms in our refrigerator) to attract them to the yard. It’s not just the bluebirds though, most all wild birds are welcomed and catered to. The bins on the screened porch store several different types of seeds, nuts, and treats for every avian diet. Feeders are cleaned and filled daily (she’s got it down to a science). Several houses built for the needs of different birds are and maintained to ensure good nest sites too. The squirrels even have their own area with corn bungees. Fresh water is abundant, with heated baths for winter, and these cool leaf misters for hot summer days, it looks like a bird spa! Until I moved here I knew little to nothing about birds. After three years, Beth’s passion for birds and caring for animals has given me a new perspective on her. I thought she was crazy opening an online birdhouse boutique before I really knew her. After seeing how passionate and knowledgeable about birds she really is, I would think she was crazy not to! When you call you are not dealing with a clerk, every order is checked for quality, packed with care and any questions you have answered enthusiastically by someone that really cares that every product is durable and appropriate for your needs. 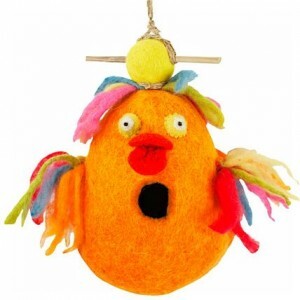 I guess what I’m getting to is that when you deal with thebirdhousechick.com you’re not dealing with a “big company” or “entity” You’re dealing direct with the real birdhouse chick.